A collected volume of stories from Shimura Takako. 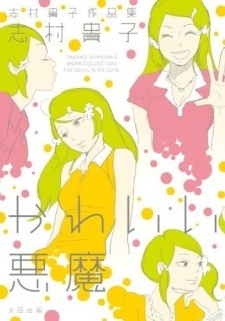 The short works collection all the Takako Shimura fans have been waiting for! The woman who appears suddenly in front of the timid boy Megumu is Nozomi, a self-proclaimed “witch’. She uses her mysterious powers to both play tricks on and help him. The “The Devil is so Cute” series, illustrating the fantastic mingling of a mysterious witch and a young honors student, is completed with a new bonus chapter! In addition to the title story, there is also “My Summer Vacation” which traces the wavering of a young girl’s heart after she falls in love at first sight at a bath house, “Unworthy Son” which captures the suffering of a young man (who dreams of becoming a comic artist) whose former teacher and object of affection becomes his stepmother, and many others, adding up to seven stories that absolutely shine with Takako Shimura’s charm.